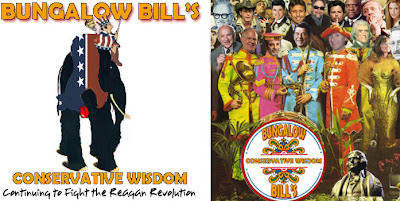 This gem is from Bungalow Bill, the man responsible for unleashing my babble on the blogophere. His blog was the inspiration for me to start blogging, so he gets the blame for those of you who may not like what I have to say. He's great! Barack Obama is going around the country saying it’s crazy that opponents of his healthcare plan says he wants to pull the plug on Grandma. But is it crazy? As a former resident of Illinois, I watched Obama come upon the national scene. I watched how he bullied his opponents through the courts to basically run unopposed from the Illinois state Senate to the US Senate. It was in the Illinois state Senate that I watched Obama’s total disregard for human life before he had the chance to defend himself from pulling the plug accusations. In Illinois, the very idea of protecting babies which survived abortions was debated on the floor of the state house. The Born Alive Infant Protection Act stopped the act of taking the life of a new born baby that survived an abortion by placing that baby in a portion of the hospital to die. It was Barack Obama who opposed the Born Alive Infant Protection Act. In fact he opposed it four times. He was the only state Senator to oppose the bill in Illinois. This got virtually no national coverage during the election—but it did get a little. During the election, Obama asked about his voting record on the Born Alive Infant Protection Act. Obama lied about his vote. He later claimed he didn’t understand the bill on the floor. Obama’s campaign had to do the damage control by admitting that Obama did in fact vote against four times. For the rest of the campaign, Obama’s lie and his voting record was ignored. Now he stands in front of Americans acting like he has a respect for life. I have to wonder if Obama voted against saving the life of a new born infant, does he really care about grandma and grandpa? Obama has lied about votes in the past when it comes to voting on medial laws that protect life. He claimed he didn’t understand the bill he was voting on in Illinois. I look at the similarities of Obama’s current campaign to forever change healthcare in America and his votes in the Illinois Senate. We recently had the I don’t understand the bill moment when he admitted to a liberal blogger that he hadn’t read that portion of the bill. So basically, Obama is going around the country promising grandma will be okay while having this horrible track record towards respecting life and admitting he hasn’t read all the bill. Gee, considering Obama’s honesty, I’d be a little worried if I was grandma and grandpa right now. Especially when you mix Obama’s voting record with the long list of government failures like Social Security, which may be busted as early as 2011 now. Nationalized healthcare and the possibility of rationing is something I don’t even want to take a chance over to find out if Obama is being truthful. "He later claimed he didn’t understand the bill on the floor." Apparently he hasn't read HR3200 either. Bats: I don't think the guy reads unless it's Alinsky's "Rules for Radicals." excellent piece..how are ya feelin blackandgoldfan?..hugs! Obummer only votes "present" . He makes me sick! He is the most evil, murderer ever, letting millions of the unborn die. He need to go to hell....he will when he dies! B & G, yes, that's all he reads, rule for radicals, and how to destroy the USA in 6 months or less. I hope you're better at the end of this day. I'm haning in there. Angel: I'm doing okay. Feeling better than before, but I think I've been trying to do too much too fast and I get nauseous. Other than that, I can deal. Hugs back @ ya!!! BOF: It is very disgusting how he votes "present" but won't read the stuff he votes on. This especially!! !